There are a range of circumstances in which you may find yourself searching for an electrician who is both professional and fully qualified. Business owners might need a helping hand with a large scale installation such as a warehouse or restaurant and those at home may find themselves pulling their hair out looking for someone who can help in an electrical emergency! Regardless of whom you are and what you need you can be sure that South London Electricians will be the right ones to help you. Our first class services are offered around the Balham area, as well as extending out to the Home Counties and South London region. The team of dedicated electricians that we have brought together work hard to ensure that each and every one of our clients are left feeling more than impressed with the level of service that they have received. Reliability, affordability and professionalism; three words that you will use to describe us and our service. For over 23 years we have been offering those in need the solution to a range of commercial and residential electrical problems. Over this time we have worked hard to build up a fantastic reputation both in the levels of customer satisfaction we provide, and in the results that our clients have seen. We have experience in helping both domestic and commercial issues and whichever one you fall into we are able to discuss your exact requirements and produce a no-obligation quotation before we commence any project with you. Our remarkable team each have experience in the different sectors of electrical work and are all equally able to bring you the right solution, each and every time. They are also aware of the relevant regulations and will work to this guidance, concentrating on full compliance. In our mind there is no job that is too big or too small and we always strive to approach each one with the same level of customer focus and dedication ultimately delivering an overall great service. To learn more about what we can do for you all you need to do is call us on 07956 523316 24 hours a day, 7 days a week and let us know exactly what you need. 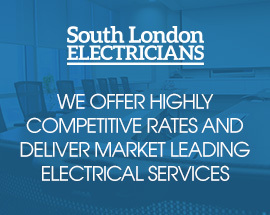 Discover electrical services at their very best with South London Electricians.